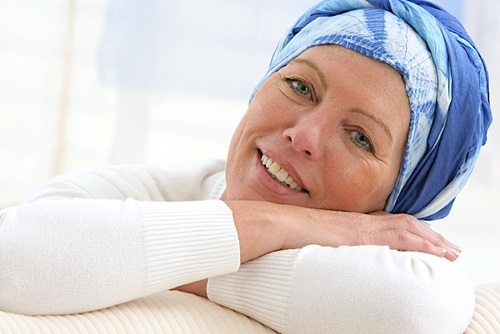 Chemotherapy often means losing one’s hair. It doesn’t happen to everyone, but it does to the majority – male or female. Men can wear a cap and be comfortable – or go bald. Lots of men are bald irregardless of having cancer. Women – w ell – this is a bigger issue. People are not accustomed to seeing bald women, although some women do accept their baldness, have beautiful heads, and look absolutely stunning. For those who do not wear bald as beautifully, there are wonderful options for chemo head-wear. I always went for the scarf because I could vary the look, feel and color according to how I felt that day. There are very fashionable chemo hats and turbans that come down far enough over your ears and hairline to cover the bald. Some even have hair attachments so that no-one would know the difference. And, then there are wigs in both synthetic hair and real hair according to your budget and needs. In my day, they were hot and scratchy. Nowadays, they are light and airy – comfortable. If you’re wearing a synthetic wig, be aware that heat can singe them. My sister found this out when she opened a hot oven. Surprise! Have lots of scarves, chemo hats, etc. to brighten your day and match your mood or event. Have fun with it. I’ve heard some really funny stories that will make your sides ache from laughing. And, laughter is good medicine.